The approval of Beyond Visual Line of Sight (BVLOS) flying and Standard Operating Procedures (SOPs) are major milestones in becoming an international go-to facility for unmanned aerial vehicles (UAV) research and development and operator training in Alma, about 230 kilometres north of Quebec City. Alma conceived of the UAV test facility, named the Unmanned Aerial System Centre of Excellence (UAS CE), in 2011 as an economic project and registered it with Quebec’s Registraire des entreprises in June 2011. Located on the town’s airport, it has access to its 5000-foot runway and services such as de-icing, snow removal, fuel and office space. Infrastructure specific to the UAS CE includes a building built in 2013 with an 8,400-square-foot hangar and over 6,000 square feet of office space. Support equipment includes a mobile ground control station, vehicles, 3G internet access and a generator. UAS CE also built eight special flight zones – restricted airspace, or CYRs for short – extending from the surface to various heights, including one to 18,000 feet. The key feature of CYRs is that they can be closed to non-authorized planes for specific blocks of time, creating safe zones for unconventional aircraft activity. The UAS CE also has access to CYR airspace belonging to nearby Canadian Forces Base Bagotville. “What we have is access to over 125,000 square kilometres, ranging up to 30,000 feet – about one-fifth the size of France,” Moffatt says. While there remain infrastructure projects poised to leap off the drawing board, the successes to date of the UAS CE are very much of note. For example, the BVLOS approval is important for any UAV operator, since simply flying around the corner of a building turns a Line of Sight flight into a BVLOS flight, which Transport Canada tightly regulates. “I find that operators are focused on Line of Sight operations. I tell them that they need to get organized, from a Transport Canada point of view, and get ready for BVLOS,” Moffatt says. Completing the SOPs was also a big coup, considering the UAS CE started with a blank sheet of paper. “I have a letter from Nav Canada and the Department of National Defence accepting our SOPs, and that Transport Canada has approved them. Transport Canada gave us a letter that lets us activate [our] CYRs through these SOPs. This is the final approval so UAS can manage these airspaces,” Moffatt says. And interest there is. Just this May, for example, the Texas Lone Star UAS Center of Excellence and Innovation and the Texas A&M Engineering Extension Service penned an agreement with the UAS CE to work together to integrate unmanned aircraft and aerial systems into North American airspace. Other companies and organizations, such as General Atomics, Aero Montreal, SparksDrone and Drone Helix are also working with UAS CE. Other players include Arctic UAV Inc., which conducted a mission there this summer, and a company from Spain that wants to do 500 hours of circuits, beginning this fall. The UAS CE is also making its new presence felt internationally. In February 2014, for example, it, in collaboration with the UAV test and service centre in Bordeaux, France; the Oklahoma State University – University Multispectral Laboratories in Oklahoma; and the National Aeronautical Centre in Wales, U.K., created the International Consortium of Aeronautical Test Sites (ICATS). Said by UAS CE to be the first international organization of its kind, ICATS’ mandate is to enable the development, testing and certification of UAVs. ICATS currently has 11 members. Involvement in military research has been another goal. The 80-by-100-foot hangar was intentionally sized to hold two Predator UAVs. “We needed to be sure that the Predators could fit into it. That was our target. We are working to follow the military procurement process,” Moffatt says. The UAS CE was built in anticipation of the procurement and testing of UAVs at CFB Bagotville, and handling military as well as civilian contracts. “If we were to have any hope in getting the United States involved, we had to meet their access regulations. So the areas of the building are card-controlled. We can restrict a visitor to just the administration area or allow access to the hangar too,” Moffatt explains. The UAS CE has had to assemble many other pieces as well, such as getting local buy-in, driving the development of new air traffic control procedures and educating government people in Quebec City and Ottawa. 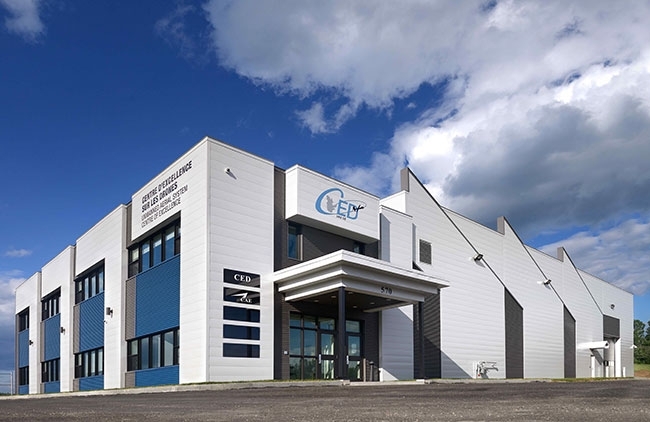 The Quebec government granted $800,000 to the UAS CE under its Aerospace Strategy, announced in 2016, and provincial and federal politicians, including Prime Minister Justin Trudeau, have toured the facility. However, to paraphrase Moffatt, both governments are still in the early stages of appreciating the potential, importance and value of the emerging UAV world to Canada. Locally, pilots had to be assured that the restricted airspace would not interfere with their flying. “We have a very large focus on social acceptance from citizens and operators [airport users]. We inform operators through emails and NOTAMS. We respect their needs and freedom to fly,” Moffatt says. Air traffic control and the UAS CE’s hard-won SOPs intersect in ways that have never been defined before, Moffatt explains. “The biggest part with a UAV is, if you lose link with the system, how [is it] going to behave? With manned planes, air traffic controllers clear the airspace if there is an emergency. But with UAVs, if you lose that link, how do you clear the airspace? How do you define it for a UAV? We are starting to define these procedures, in general. We need to get organized on training air traffic controllers on SOPs. “We are a test site, a test bed. We are breaking ground to satisfy Transport Canada inspectors and refining the SOPs as we go along. It’s a huge issue. There are no Transport Canada guidelines or guidance on how to write the SOPs,” Moffatt says. Issues covered by the SOPs include takeoff, landing, communication, conflict detection and avoidance, altitude, separation from other UAVs and from regular traffic, flight termination points, emergency communication and lost link. Take, for example, a lost-link emergency. “As soon as you lose control of the system, it must be able to go to a specific place and hold, or come back automatically and land,” Moffatt says. Or communications. “One of the restrictions we impose is having on-board relay communication so the operator can hear and communicate with manned traffic that may try and communicate with a UAV,” Moffatt adds. Last fall, Moffatt organized a meeting of 70 organizations in Quebec to develop an action plan and continue to encourage Ottawa to development a federal strategy to support the UAV sector. The UAS CE is well on its way to bringing the Canadian UAV industry and its customers into this new slice of aviation. YQB has built it – will they come?